Diageo's Classic Malts Selection has introduced many U.S. consumers to a range of Scotch flavors. The basic line up found in many bars is backed up by a collection of special releases of limited edition bottlings. With so many whiskies, Diageo has rolled out Malt Matcher, a free iPhone application designed to help single malt drinkers pick out the dram that matches what they like the most. 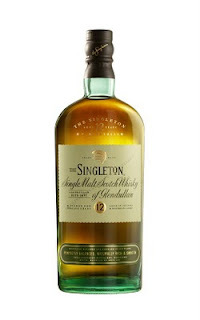 The Singleton of Glendullan 12 Year Old is a Speyside single malt that uses ex-Bourbon and ex-Sherry barrels during the aging. The 80 proof whisky has a medium body, round sweetness, hints of fruit and citrus, with a lovely smoky grain base.